Move through eight power shifts by simply using the up and downshift buttons and range button on the main gear lever. Make clutchless directional changes using the momentary shuttle. Change between A/B or C/D ranges using a power clutch button. Move between B/C ranges using the foot clutch and transmission control lever. The optional autoshift function provides many ease-of-use benefits. Simply select field or road mode and the autoshift will automatically shift between a set span of gears, based on target speed and engine load for the given operation. Although autoshift is a great option for novice operators, it also can increase the tractor’s productivity by helping to maintain a constant speed for the application. When we say you can select your comfort zone, we mean it. Cabs are standard on all six utility Farmall C models. Or choose the non-cab option knowing you’re not giving up many of the same deluxe features. Operators Platform: Your comfort starts with plenty of room to maneuver and nothing to get in your way. The large, flat operator area and deluxe features on cab and non-cab tractors provide outstanding comfort along with ease of operation and exceptional visibility. Cab Comforts: Cab models offer air conditioning, along with 10 dashboard vents. Opening side windows provide fresh-air circulation. All controls and levers are within easy reach from the comfort of the operator seat. Easy Access: Best-in-class accessibility to the driver’s seat, with two doors and self-cleaning steps on each side, help make daily chores and other work go more quickly with less operator wear and tear. Seat Options: A redesigned operator’s seat provides exceptional comfort and productivity. Or choose the optional larger air-suspension driver’s seat with a full 15-degree pivot. Non-cab models feature a vinyl seat with armrests. Ergonomic Loader Joystick: To get the greatest productivity from your loader, it should be easy to operate. An ergonomic, factory-installed loader joystick integrates into the right-hand console. Rear Sightlines: The hinged rear window opens completely and is supported by gas struts. The lower viewing window provides increased visibility to drawbar, 3-point hitch and remotes for reduced neck strain. Easy to Use: The easy-to-read instrument cluster includes engine coolant temperature, fuel level and engine speed gauges, plus a digital speed readout on cab models. Cab models include an instrument cluster that pivots with the steering wheel. Instrument functions and positions are common with the rest of the Farmall series tractors for familiarity and ease of use. Protection With Flexibility: A two-post roll-over protection structure (ROPS) provides protection without sacrificing visibility. The structure is foldable so you can complete tasks in low-overhead areas, and an optional sunshade canopy provides sun protection and a cooler environment on long, hot days. Looking Ahead: The stylish, sloped hood on all Farmall series tractors provides clear, unobstructed forward sightlines to the front wheels, loader and other front-mount attachments. Loader Views: A curved front window frame top increases loader visibility. The optional high-visibility roof panel with opening window allows the operator to see full-range loader operation, even when the loader is extended to full height. Instrumentation: Well-placed controls and the instrumentation dash’s design provide easy access without inhibiting visibility. The utility Farmall C series gives you the deluxe features you need at a great value. When it’s time to get to work, these tractors offer the power and flexibility — a heavy-duty 3-point hitch; high-capacity, responsive, dual-pump hydraulics; and an independent PTO — to support a full suite of implements and attachments. 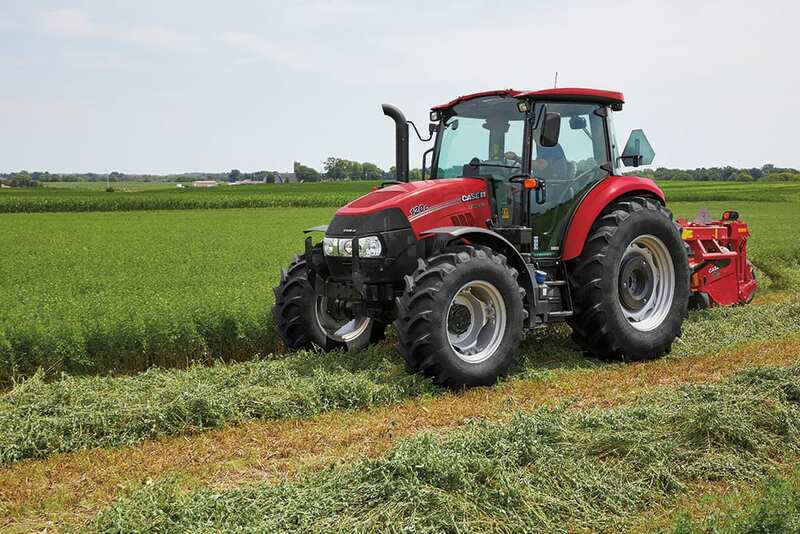 PTO configurations depend on the tractor model you choose. Standard and optional configurations include 540 rpm, 540/540E and 1,000 rpm. The 540/540E PTO option provides greater fuel efficiency during less-demanding applications. Power With Maneuverability: Separate steering and implement hydraulic reservoirs let you lift heavy loads without sacrificing your ability to steer. The open center hydraulic system, remote valves and 3-point hitch, featuring flexible lift arms and telescopic stabilizer, make the tractors capable of handling nearly any implement. Remotes: Utility Farmall C series tractors include two standard rear remotes. For even greater flexibility and productivity, add an optional third remote. Tractors with the factory-installed, loader-ready option feature two mid-mount remotes. Flow Rate: Utility Farmall 65C and 75C models pump 12.5 gallons per minute (gpm); models 90C through 120C pump 16.9 gpm. Utility Farmall C tractor paired with Case IH L566 loader: 2,046 lb. Utility Farmall C tractor paired with Case IH L575 loader: 2,354 lb. Utility Farmall C tractor paired with Case IH L735 loader: 4,034 lb. Heavy-duty 3-point: Telescopic lower links and stabilizers simplify implement attachment. A single turnbuckle levels attachments. Extendable Drawbar: An extendable drawbar lets you customize hitched implements to your desired position or move the drawbar to keep it out of the way when not in use. Choice is good. Whether cutting, putting up or hauling hay, cleaning cattle pens or moving snow and maintaining the farmstead, utility Farmall C series tractors deliver all the power and traction you need. Choose the best option — depending on the traction and maneuverability your operation demands. The 2WD option is ideal for lighter field work and maximum maneuverability. Go with 4WD for improved traction and increased power to the ground. Utility Farmall C series tractors include fenders and handles for easy entry and exit. Utility Farmall C series tractors let you get right to the task at hand without time lost on routine maintenance. After all, the sooner you get to work, the earlier you finish. Easy Access A single-piece hood opens without tools. Gas struts support the hood when open for quick, easy access to engine components and checkpoints. Fueling is fast and easy with fuel-tank access from the ground or from the operator platform. Uptime Check and fill engine oil without opening the hood. A 600-hour oil-change interval reduces downtime and maximizes uptime. The utility Farmall C series gives you the versatile tractor you need at a great value. Outstanding performance and stability, along with heavy-duty frames and rugged components that are designed to be compatible with a wide range of tools and attachments, help you accomplish more, more efficiently. 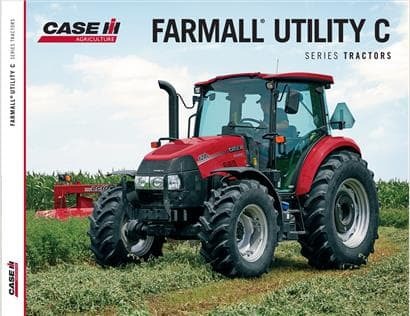 Case IH L505 and L705 loaders are designed specifically for use with your utility Farmall C series tractor. These loaders feature double-C channel arms for structural strength and streamlined appearance. Curved-boom loader arms let you easily see to the top of the bucket and around the front tires. Integrated park stands and the quick connect system improve efficiency. Your Case IH dealer offers a full line of attachments to help you get the most productivity from your utility Farmall C series tractor. Implements are quick and easy to hook up and include disc mowers, wheel rakes, round and square balers, rotary tillers, backhoes and many others. When you order your utility Farmall C series tractor with the complete loader-ready option, it arrives with the appropriate loader-mounting brackets, two mid-mount hydraulic valves and a front grill guard already in place. This convenience package lets you install and remove your loader in minutes. The factory-installed loader joystick is integrated into the right-hand console for easier operation and greater productivity. The Case IH utility Farmall 65C is capable of handling many chores around the farm and the ergonomically designed operator environment means you'll be comfortable doing them. The Case IH utility Farmall 75C is an all around workhorse, yet delivers a level of operator comfort that makes long, hard days more productive. The utility Farmall 110C was designed with input from customers in the field, it's ready for any task.